Pores are something we all have. Really they’re all over our body (except the palms of our hands and the soles of our feet and other places like eyelids) but we don’t notice them, only the ones on our face! Everyone’s are different, pores range from sizes and the amount of blackheads in them. I know when it comes to skincare we want to reduce our pores and clear them of blackheads but really do we know what pores and blackheads are? This is when I came to do my research and I though I’d share it as it’s really interesting and useful to know about. I am no means an expert and most things from this post come from google so keep that in mind. To put it down basically, pores are described as small openings in the skin where oil and sweat leave the skin from their respective glands below. pores do serve an important purpose, they produce sebum, a natural oil created by our body that is essential to keep your skin (which another fun fact is your largest organ) moisturised, and functioning well as it is the protector and insulator of your body, without the oil you wouldn’t have healthy skin. Then the oil is dispersed from the hair follicle over the surface of your skin through tiny almost like holes which are your pores. Sometimes though they can produce too much oil due to hormones, stress or other things. Pores do a good job of collecting oil, dead skin cells and other nasty stuff on your face but instead of leaving they get stuck in the hair follicles and this is pretty much how spots / blackheads form. To get rid of them the best way is to try keep your skin is clean and cleansed as possible to remove all the bad stuff and stop the pores collecting it! You can try as much as you want to shrink your pores but it’s impossible, they come from genetics! You can maintain them by using products to reduce them but they’re not going to change in size the most you can do is minimise their appearance. The oil glands on your nose and forehead are bigger than everywhere else so they are more visible leading to more chance of them getting clogged and creating blackheads! Blackheads are mix of your dead skin cells and sebum that sit in your pores. The reason they’re black is because they oxidise when they’re exposed to the air. They’re pretty much a pain and are something that you can’t avoid so you have to maintain them. They’re so many ways to maintain / get rid of blackheads, like the most obvious is pore strips! Some people use the black peel masks that are really painful but personally I’ve never tried them. Personally I barely use pore strips because the ones I’ve tried have barely worked but I’d love to try the biore ones!! A ingredient that’s really good for that is salicylic acid as it helps dissolve blackheads overtime and is found in one of my favourite products the garnier pure active 3 in 1’s! I love both of them equally and I do think they’re really good for helping my blackheads. Sidetracking from skincare, using a primer helps the look of pores disappear! One product everyone knows and I do recommend is benefit porefessional! It makes your skin look photoshopped it’s so smoother and really does reduce the look of pores. Into the last thing which is pretty obvious is facemasks. Having skin that’s not clear makes me choose face masks that’s reduces spots and I find that they tend to have the active ingredients that fight pores! 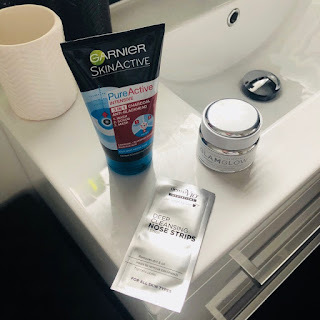 I do notice my masks pick up pores and they look reduced once I’ve done so you can get masks to help pores too, it’s all about doing the research. I really did enjoy doing the research for this post, it really educated me on blackheads and I learnt so much I didn’t know! I love educating myself on things and sharing my knowledge with people who are really interested. I do hope this helps one person because I put a lot of effort into this!